We stock teardrop style racking, Rapid Rack and Silver Rack. 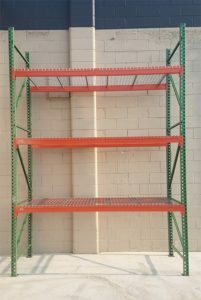 All other racking can be drop shipped to your business, or shipped to our warehouse for you to pick up. We will assist you in finding the pallet racking you need. So whether you are adding to your existing pallet racking or need to start fresh, we are able to help you find what you need. Pallet Rack - New teardrop style upright frames, cross beams and wire decking. Thousands of items can be drop shipped from our online catalog - or request a paper copy today! Get all the parts you need to quickly build one standing bay of pallet racking with three levels. Our customers utilize pallet racking for a huge variety of applications including: regular pallet storage, bulk storage, archive storage, retail displays, marine storage, furniture, carpet, snowmobiles, lumber, drums, reels and more! We supply drive in racks, push back racks, carton flow racks and cantilever rack along with cat walks and mezzanines. We offer accessories for storage of cylindrical storage (such as drums) and holders for reel storage. We offer a large inventory of pallet racks and wire decks stored inside our large warehouse right off of Main Avenue in West Fargo. Our inventory includes a large variety of different sizes and capacities of uprights and shelf beams. We also have wire decking available to fit most sizes and brands of pallet racks. We always stock Post Protectors, Wall Spacers, Row Spacers and Crossbars which eliminate the fire hazard associated with wood supports. We can help you plan out what you need so you can begin building your warehouse or storage!